Seoul, Korea - Universal Creators is proud to announce the release and immediate worldwide availability of Flashlight LED for iPhone and iPod touch. It is the most high-speed, the brightest the easiest to use flashlight on the App Store. 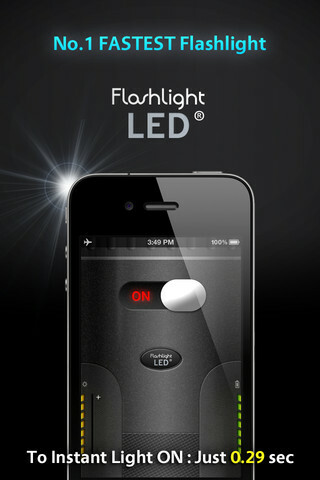 Flashlight LED will instantly brighten the night just in one click. With update Flashlight LED becomes even better and proves its number one title. Due to unique state-of-the-art algorithm Flashlight LED is 2x faster than other apps across different platforms. Moreover battery drains slower while the time of use doubles. Thanks to LED flash Flashlight LED is 10 times brighter than other apps. Flashlight LED is optimized for both right handed and left handed users. In addition, the app is only 0.5Mb. It can be quickly downloaded without worrying about the data usage. It is a great app that can be used anywhere and anytime for finding keys or other lost items in the dark, reading a book at night, checking on kids etc. "Our team strives to create simple and handy apps for anyone to use. Our Flashlight LED focuses on speed, simple and usefulness for the handling emergencies without heavy functions. I don't want to have any other flashlight any more. "- said Brian Nam, CEO of Universal Creators. Flashlight LED 5.3.4 is $0.99 USD (or equivalent amount in other currencies) and available worldwide exclusively through the App Store in Utilities category. Universal Creators is a small company located in Korea. It strives to create useful Mobile and PC apps with focus on usability, user interface and fun. Copyright (C) 2012 Universal Creators. All Rights Reserved. Apple, the Apple logo, iPhone, iPod and iPad are registered trademarks of Apple Inc. in the U.S. and/or other countries.